Although I always strive to eat a whole foods no-oil vegan diet, I do love to stray every so often with packaged items from Trader Joe’s. As you may know, Trader Joe’s is extremely vegan-friendly. 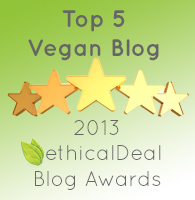 They carry a wide assortment of clearly marked “vegan” items, including frozen foods, cookies, and other goodies. I’ve blogged in the past about things I like to buy at Trader Joe’s, but I thought it would be fun to talk about today’s purchases. Today I spent a total of $37.37 for my vegan items. 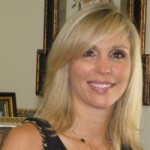 I made these particular purchases because I was feeling lazy, and I wanted quick and easy meals and snacks on hand. So, what did I buy? 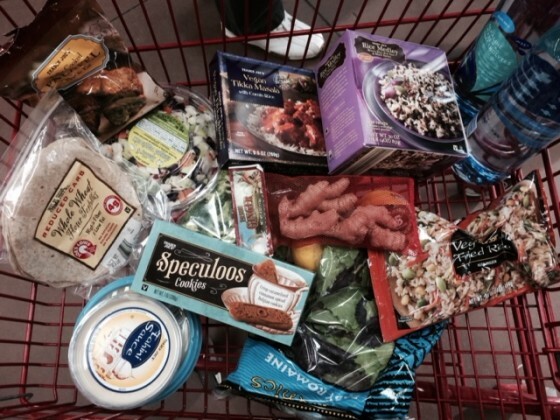 WHAT WAS IN MY CART TODAY AT TRADER JOE’S ? I felt a bit “under the weather” this week, so I made some fresh ginger tea with lemon. This always seems to make me feel better. I think it worked! 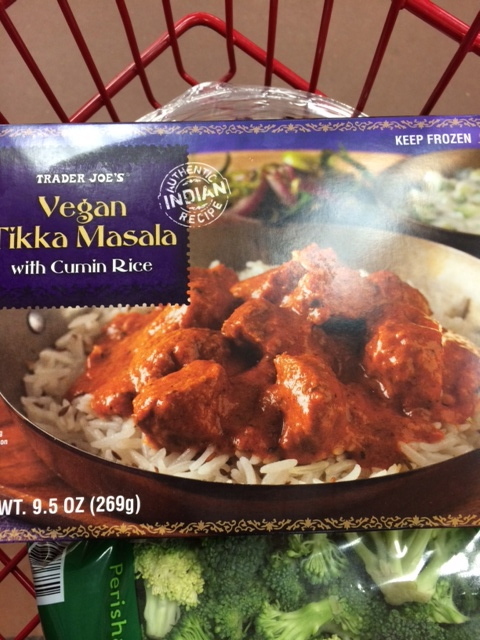 Trader Joe’s was offering free samples of their Vegan Tikka Masala today, and it was surprisingly very good! I bought a box to have on hand for a speedy meal when needed. I really don’t believe in buying bottled water, but I did it anyway. I don’t know why! If you are vegan, do you ever leave a supermarket without hummus? Neither do I.
Tahini sauce always comes in handy! I never leave Trader Joe’s without buying their Healthy 8 Chopped Veggie Mix. I use it in salads, sautés, sandwiches, and wraps. 3 minutes in the microwave and voilà! 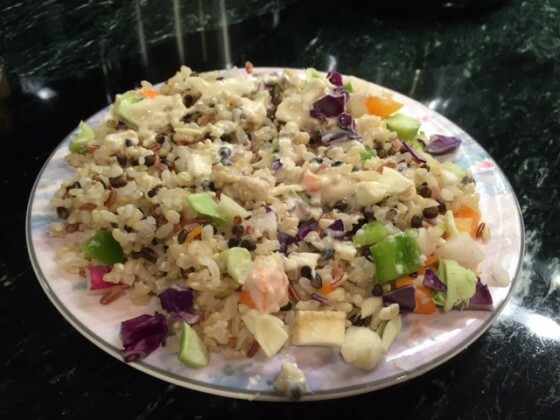 Tonight I made the Rice Medley and mixed it with Trader Joe’s Healthy 8 Chopped Veggie Mix and Tahini Sauce. It was really good! Although I believe that the low carb craze is way overrated, I’ve been eating Trader Joe’s Reduced Carb Tortillas for years. I like them and they’re vegan. You can make cute little wraps filling them with hummus, Healthy 8 Chopped Veggie Mix and Baby Romaine. How easy is that? I’ve been buying these frozen falafels for years too! Just heat & eat. Need I say more? Another handy frozen foods item which is great as a side dish to any vegan meal. I’ve been enjoying these crisp caramelized cinnamon spiced Belgian cookies with my tea for quite some time. And yes, they’re vegan! 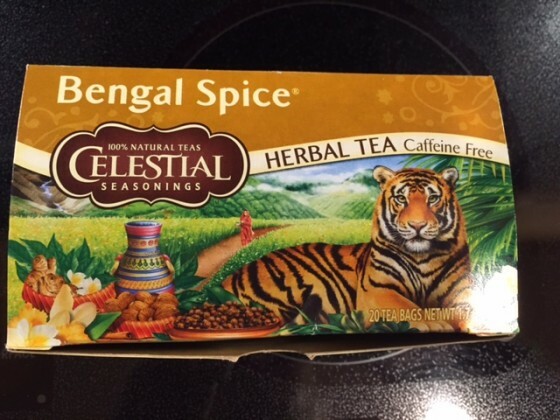 And since we’re talking about tea, I’m now hooked on this tea after it was recommended to me by my good friend, Helen. However, this recommendation has nothing to do with Trader Joe’s. Just a little bonus for you, you lucky devils! I hope you enjoyed a peek into my excursion today at Trader Joe’s! It seems like Trader Joe’s has more and more vegan items every day! Great for us!